Rwanda is so small its name doesn’t fit inside borders on a average map of Africa. But small has nothing to do with fascinating – and this little country, wedged between the Republic of the Congo, Uganda, Tanzania, and sister-state Burundi is one of the most interesting and absorbing places you can possibly visit at this moment in history. And it is beautiful besides! Rwanda has three spectacular national parks, all three pristine bird- and wild- life preserves. They are: Volcanoes National Park, in the Northeast where visitors can view the huge, highly entertaining Silverback gorillas within close range; Nyungwe Forest in the Southwest with winding jungle trails, water falls, and free-ranging monkeys, chimpanzees, amphibians, reptile, butterflies and countless bird species; and Alagera to the East with buffalo, elephants, zebra, giraffe, antelope, and the largest concentration of hippos anywhere in Africa. I hope to visit these parks on another trip, but my purpose for this one was to get a sense of Rwanda before it becomes completely un-recognizable as an example of “old” Africa. The European colonizing days are over and the era of brutal, self-aggrandizing African dictators that the colonizers left in their wake appears to be drawing to a close. Globally, both the West (Europe and the U.S.) and the East (China and India) have begun to engage with Africa in large philanthropic and commercial enterprises. I was eager to see what life was like for Rwandans at this moment, when I could still see traces of the past. Much of what Rwanda is like today stems from the country’s effort to recover from the 1994 genocide, but it is now past the early stages of recovery and poised to be part of the 21st century. I felt I had to see it before too much changed forever. I flew to Rwanda from Nirobi on a KLM flight from Amsterdan — an easy and direct way to get there. 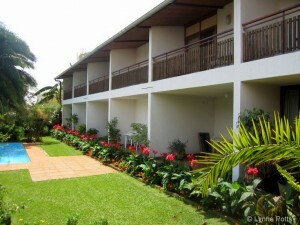 Hotel Garni in Rwanda’s capital, Kagali, where I had booked my stay, was a short twenty-minute ride from the airport and located in what is often referred to as the city’s center. As a small hotel with only two floors and a total of 11 rooms and an air of gracious hospitality, it was just my cup of tea. Also it had gorgeous grounds abundant with phlox, morning glories, geraniums, hibiscus, marguerite, birds of paradise and more. While the city is spread out over 282 square miles, there is only one real skyscraper — and downtown covers only a few blocks, not looking much different from other centers scattered about this sprawling municipality. Taxis and hired cars are available, but by far the more most common mode of transport is the moto-taxis which exist in the thousands. Drivers of these, by the way, give you a helmet and the ride is generally safe, though some people warn the hospitals have plenty of moto-taxi accident victims. I took my chances. Kagali is located more or less in the center of Rwanda making it the hub of 6-8 black-top roads radiating out from it in all four compass directions. In addition to these main roads, smaller dirt roads branch off leading to “towns” though only a dozen of these are anything more than a collection of small shops with a gas station. I hired a driver to take me north to Byumba one day, and east to another Kayonza on another. For the other two directions, I took local buses. My English-speaking driver, Tim Mutijima gave me background on customs, economics and political views in the country; the bus trips gave me an inside view of every day life – and a chance to talk to anyone who would speak English with me — which turned out to be quite a few. People are shy, even reticent, but very friendly if you ask questions or need assistance. Rwanda is often described as the land of a thousand hills but I’d say this has to be an understatement. It must be at least ten thousand hills — maybe more. Wherever you are in Rwanda, you are either going up a hill or coming down one; where you look you see hill after hill until the distant ones blur into the horizon. That’s in the distance, close up you see thousands of narrow dirt paths that wind up into those hills. This is where people live in small, usually one-room houses made of mud brick. Clusters of these small houses, my driver Tim told me, are the center of Rwandan social life and daily routines. The average adult, Tim said, walks 10-14 miles a day, leaving in the morning to work in the fields, then to market stands along the road (buying and selling), then back to the fields, and finally back home. Everywhere we drove, we saw women walking with baskets of produce on their heads, men walking or pushing bicycles with goods, and children, the water carriers, with yellow gallon-size plastic jugs on their heads and in their arms. Carts drawn by animals and automobiles for personal use are almost non-existent. The produce women are carrying on their heads are various kinds of produce for trading: cabbages, potatoes, cassava etc. A basket of sweet potatoes, for example, might pay for a small tube or Colgate, a comb or a pair of children’s flipflops, Tim said. Rwanda has more people per square mile than any other African country, and almost all of its hills are terraced to provide as much food as possible. Nevertheless an estimated 44% of the population is malnourished. I visited Gardens for Health (GHI), a non-profit formed by two American women to provide Rwandans with health and agricultural information that will reverse poor nutrition in impoverished families. Jessica Cronan, Executive Director of GHI told me that while 85% of Rwandans are farmers, the government mandates what people grow reducing incentive to garden healthy vegetables for personal consumption. In addition, Cronan said, Rwandans are influence by the prestige foods imported and touted as healthier. While rice is more expensive, for example, people will buy it instead of native potatoes that are much cheaper and just as good. Rwandans have a very high carb diet, but not a nutritious one. It is loaded with rice and beans, cassava, plantains, and potatoes – all carb heavy – and they have very little oil or fat,” Cronan said. Several told me most Rwandans have only one meal a day. I visited a clinic that GHI conducted with a partnering health organization where parents in the nutrition-education program were weighing and measuring infants on a monthly basis. 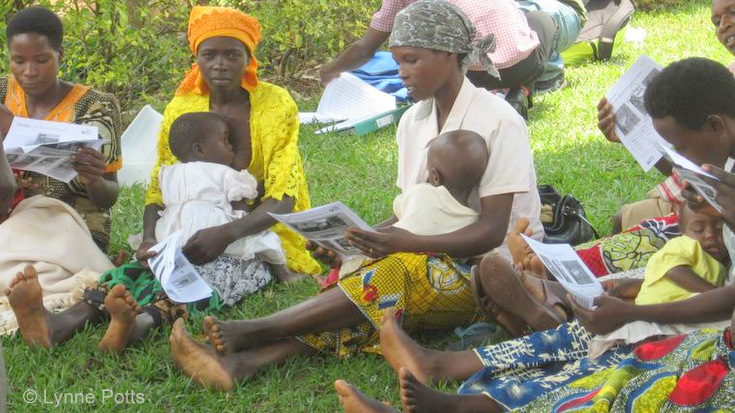 Although babies were terrified and todders were screaming to be held, mothers in the program were smiling broadly as the clinicians checked the records and delivered news of marked improvement in the children’s growth. Many said until now they had no idea how to feed their babies so they would be normal and healthy. Much good health information was lost when an enormous percent of the adult population was killed in the genocide. A schoolteacher I met on the bus to Butare told me the government is in the process of organizing and better distributing land to address the food problem, but general poverty prevails. The country has no resources of its own, he said; its only significant exports are tea and coffee. President Paul Kagame is encouraging foreign investment and allowing foreign land ownership for development, but he is also trying to ensure that Rwanda does not get taken over by foreign real estate speculators as many of its neighbors with large tracks of land owned by outsiders. The story of how President Kagame led the Rwandan Patriotic Front (RPF) to defeat the majority Hutu government that had been in power since 1959 is long and complicated—, but many say Kagame can be considered a great contemporary-Africa success story. While there are detractors and there is still much to be done, Rwanda today is one of the safest countries in African, with an anti-corruption track record that has caused many other countries to use its banks instead of their own. I would like to add that Rwanda is also one of the cleanest places I’ve ever been — no roadside trash, no plastic bags caught in trees, no food or papers on the ground outside shops and houses. Madonna also told me that every April Rwandans take a week to remember the genocide. Schools and business close, radio stations suspend regular programming, churches open as meeting places, and people are encouraged to talk about what they and their families experienced during the terrible 100 days of murder and butchery in 1994. Madonna said the government brings in mental health works and volunteers from NGOs in other countries to give mental and psychological support while Rwandans, sometimes fainting or having seizures, relive their traumas. Finally, the gacaca courts, born out of the tribal tradition to bring perpetrators before the whole community for a hearing, are another way of implementing the recovery process. Besides these, Rwandans remember the genocide with memorials and museums: Murambi where 27000 people were killed, Nyamata where 2,500 were massacred in a church, Ntarma Memorial where the remains of 5,000 are left on display along with their belongings, and others. The Genocide Memorial Center in Kagali displays the story of the genocide in pictures, film and documents and holds tombs for more than 2, 500 killed in the massacre. It’s an impressive modern structure spread over meticulously gardened acreage. In the light of all the country has done to recover from the horrors of their recent history, one cannot help admire the achievements of present Rwanda. On the other hand, one can not help but wonder what the future may hold. A photo I took of a man pushing a bicycle up the hillside beside a newly paved road constantly comes to mind when I think of that future. 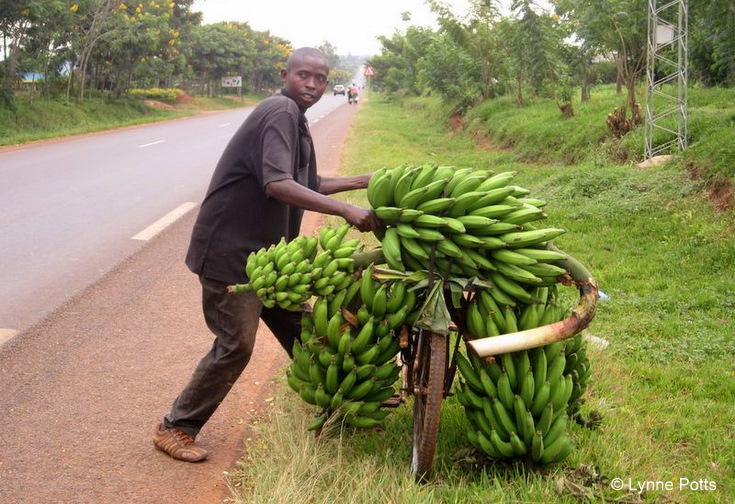 The man in it is trying to balance enormous bunches of bananas on the handlebars, bike frame and fenders. The road itself has only one car in the distance. I keep wondering how long it will be before trucks will be carrying those bananas for that man – and before Rwanda’s lush countryside and quiet bucolic life will be gone forever. On the other hand, throughout history peoples and civilizations have only advanced as they have come in contact with others who have knowledge and information they did not formerly have. Surely this will be the case for Rwanda. Lynne Potts is a seasoned free-lance writer with articles in newspapers, journals, and literary magazines. Her recent book A BLOCK IN TIME has just been published and her book of poetry, ALL WHILES WAITING ON BEAUTY, will be available in the fall of 2013. Thank you Lynne for your brief visit to Rwanda and taking the time to try to interact with many people here including myself. I hope indeed that you will take the time to visit us once again while am still stationed in Rwanda. Then you will see if indeed it has changed much from the time you were last here. However in the meantime, I would like to reassure you that am pretty sure 5 years from now, other than the population explosion, the beauty of Rwanda will still be intact out in all the Natural reserves. So indeed do come back for a repeat visit.